My thoughts are going over the events of the last year and wondering how we got through. There is so much to be thankful for. This is by no means a complete list of all who made a difference this year but I want to say thanks to all of you who made a difference. We are truly so blessed Billy Ray is here with us. During the 9 days on the ventilator in Critical Care this past July I really wasn't sure he would be here by now. People prayed that I didn’t even know and he is here enjoying Christmas. Of course, having great doctors made a big difference. I can't begin to explain the strength I felt increase when I saw my brother, Jim, walking down the hall. Jim and my sister-in-law were with us through the first few hard days. My mom kept people updated and returned phone calls that I couldn’t possibly do. I was horrified when they started letting Billy Ray wake up with that thing down his throat. The doctors told me they wouldn't do that when I agreed to let them put it in. His father's description of the terror he experienced waking up on the ventilator was clear in my memory. If it so terrorized my late husband, how would Billy Ray feel. My stepson, Michael and his wife, Rebecca were there when that happened. I had noticed his restlessness and tried several things telling him to blink for yes. He didn't blink until I asked him if he wanted me to go out so "Bubba Mike" could come in. I knew then that his cognitive ability was not damaged from the incident when he blinked so quickly at that cue. 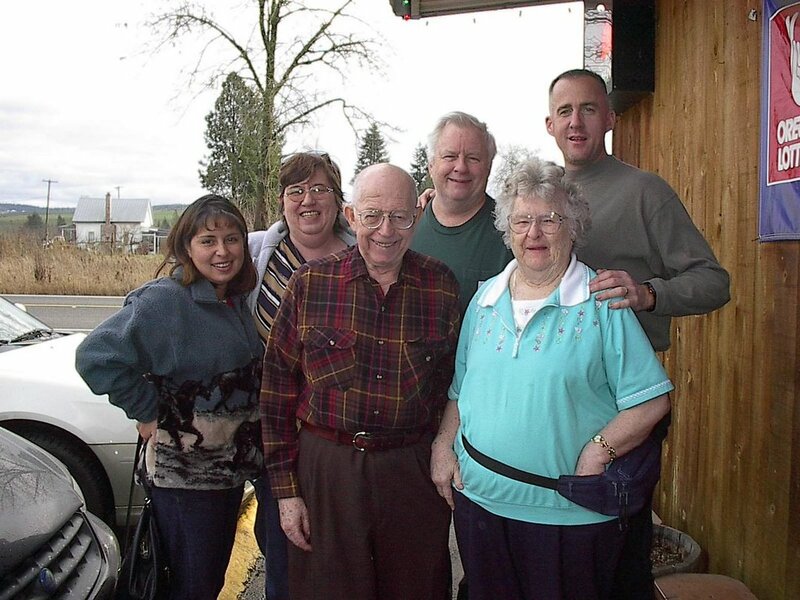 In the picture on the right Rebecca, my mother--in-law and father-in-law are in the front row. Larry and I are in the back row with Michael. I know I said it before but I have the best mother-in-law you could ask for. She does special things for me personally that I can't possibly describe. I may have shared before that she made unbreakable coasters for the coffee table and put them in a nice basket so that WHEN (not if) Billy Ray throws them they can't hurt anyone. Mom Luci makes it a point to try to understand what Billy Ray can handle and what he loves. She is a constant encouragement about my writing too. Here is another example of Mom Luci's effort to do something special. She knows that I love music boxes and lighthouses. My Christmas present this year is a mirrored music box with a lighthouse and dolpins. It makes me feel so femine winding it up and looking at it on the top of my computer credenza. She also knows her son and my son well. 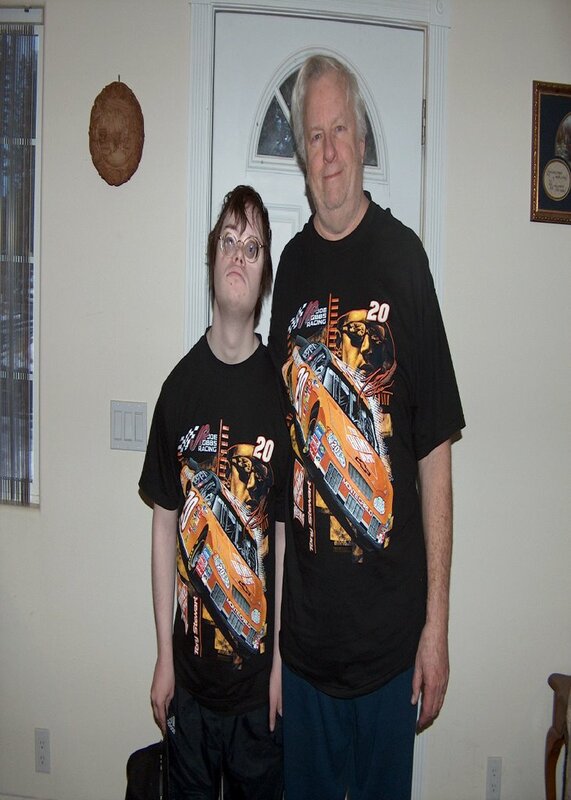 Larry loves racing especially NASCAR and Billy Ray wants to be just like his stepfather. Pictured are Billy Ray and Larry this morning in the matching teeshirts they got from Grandma Luci. Our church family has been right supporting us all year. I shared in my previous post how one family even loaned us an RV and another hauled it when Billy Ray was in the hospital so I could stay right there with him. The cookie lady, Donna, making cookies every week to aide with constipation issues for Billy Ray and so many other things from the “family” I couldn’t even hope to list. Dave Peters has been my assistant in the Lighthouse Parents ministry and a real friend of our family. I feel like I have another whole family at AMACOM Books who were so supportive of me though they were trying to get my book in print during Billy Ray’s crisis. The new consultant and friend, Keddie, has helped me with staff training according to my methods so that I could focus on writing. Our county case manager has been there everytime as has his supervisor. I am so glad we were in this county when the crisis hit. Hope it is going well for you and your sunshines. There are so many stresses but hopefully you will have some time to reflect on the blessings and even baby successes your child has achieved.